The inside of Jelly Fresh. Jelly Fresh is a clothing shop in Booyah Base run by Jelonzo, a hip Jellyfish. 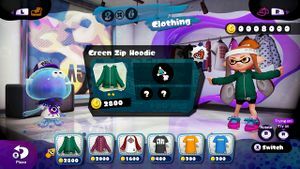 Jelly Fresh sells shirts and jackets that can be purchased with cash earned from multiplayer matches and amiibo challenges. Players can tilt to rotate their Inkling and click to try on the highlighted item, and pressing purchases this item. Pressing or allows players to enter Shrimp Kicks and pressing or similarly allows them to enter Cooler Heads, while pressing takes players back to Inkopolis Plaza. displays further information about the selected item. Jelonzo's shirt changes each day the player visits Jelly Fresh. He has four of them. The smaller text on Jelly Fresh's sign, loosely resembling its Japanese name, "Sas Au Bon". A Camo Zip Hoodie in the window in Jelly Fresh. More clothing seen in Jelly Fresh. Concept art of Jelonzo, showing him stretching out his tentacle to get a piece of clothing in Jelly Fresh. Three signs in Inkopolis Plaza, which appear to be advertisements for Jelly Fresh. Italian Meduchic A play on the words Medusa (Jellyfish) and the french word Chich. Spanish (NOA) Prêt-à-Méduse A portmanteau of the words Ready-to-wear (Prêt-à-porter) and Jellyfish (Méduse). This page was last edited on 3 July 2018, at 04:39.